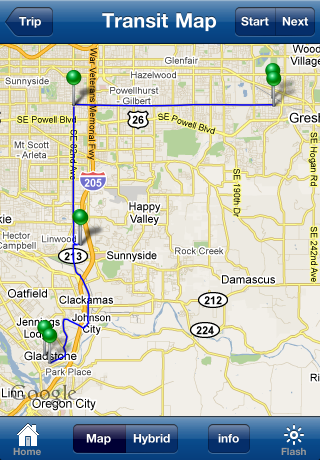 PDX Bus - a free Open Source iPhone app for Portland bus and train times: PDX Bus version 5.0 is ready! PDX Bus version 5.0 is now ready. Lots of new improvements (mostly trip planner stuff) plus MAX colors, searching for stops and new colors. Trips can now be bookmarked and then re-planned with a single touch. Check out the bookmark icon in the toolbar on the trip screen. Tip: bookmark a trip from the Current Location to your home and call it "Take me home!" The Trip planner user interface has a new more intuitive flow, and the map has a previous/next button to step through the trip. Trips are automatically saved to a new "Recent Trips" screen and can be viewed later without a network connection. 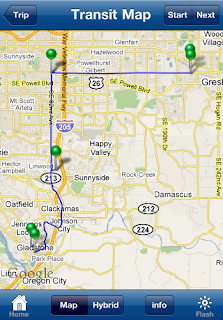 Trips can be texted to other cell phone users directly from inside PDX Bus (requires an iPhone with iOS 4.0). Trips can be added as events to the calendar (iOS 4.0 required). Trips planned using the GPS now show the location's name instead of 'Current Location'. Added 'Search rail stations' screen. Rail arrivals include a colored circle to indicate the line. Stops can be sorted alphabetically. Recent stops now have their own screen. Added up/down arrows to the rider alerts and fixed fonts sizes. Settings now update instantly in iOS4; added Color Themes and made it blue by default. I would really like to see C-Tran included. How can that happen? Several people have asked me about C-Tran. C-Tran does not have a "Transit Tracker" style system in place at all - they would need to get that up and running before anyone could write an app. C-Tran could have their stops and routes added to google maps by adding their data in the google transit format, but as far as I know, they have not yet done this.